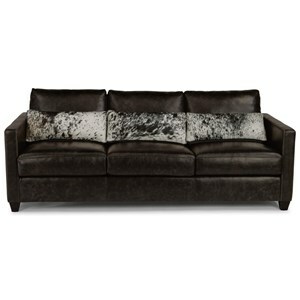 The Beckett Sofa will bring a luxurious look to your living room decor. It features a button tufted design on the back and insides of the high track arms. It features Mocha finished tapered wood legs for a contemporary looking base. Two feather down throw pillows are added to complete the look of the sofa. The Interiors - Sofas Beckett Accent Sofa by Bernhardt at Reeds Furniture in the Los Angeles, Thousand Oaks, Simi Valley, Agoura Hills, Woodland Hills, California area. Product availability may vary. Contact us for the most current availability on this product. Take a cozy seat on this stylish and comfortable Interiors sofa collection. Plush cushioning and throw pillows allow you to relax in comfort, while the other details like exposed wood or tailored skirts give the collection a boldness you and your guests will enjoy. Ideal for the household who hosts guests frequently, or efficiency apartments. Customize the collection by choosing from a variety of fabrics to fit your own personal decorating style. The Interiors - Sofas collection is a great option if you are looking for furniture in the Los Angeles, Thousand Oaks, Simi Valley, Agoura Hills, Woodland Hills, California area. Browse other items in the Interiors - Sofas collection from Reeds Furniture in the Los Angeles, Thousand Oaks, Simi Valley, Agoura Hills, Woodland Hills, California area.